For those of you who regularly read my blog, you know that myself and six other wonderful ladies make crazy quilts for the Mennonite relief sale held every year at the Kansas State Fairgrounds. We always go to see them auction off our items, plus the sale is just plain fun to go to! On two occasions, members of our group have bought the quilt we made. This year the sale happened to fall on the day when Kansas was at risk of having very severe weather. When you live in Kansas, you kind of become used to the fact that there might be a tornado(be that good or bad!). We headed to the sale early in the morning, knowing that the predicted storms were to arrive in the evening. For the last two years the quilts at the sale have not done as well as they have in the past and I would attribute that to the economy. 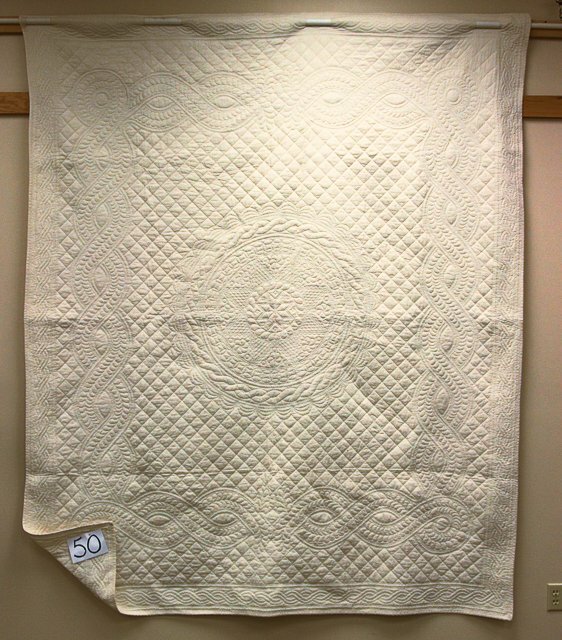 Well, this year, despite the weather, there was a full house at the auction and quilts went for exceptional prices! Our 12 small wall hangings were auctioned off separately for a total of $1610! We were very pleased with that!. The Valentine block pictured above did the best by coming in at $210. The November block came in at $175, not bad for a 12 inch square crazy quilt block! 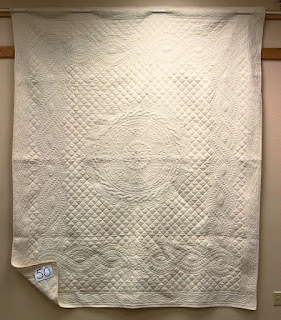 This whole cloth beauty went for an astounding $8,100! It was beautiful and all hand quilted. After our items were auctioned off we left to head home before the storm. 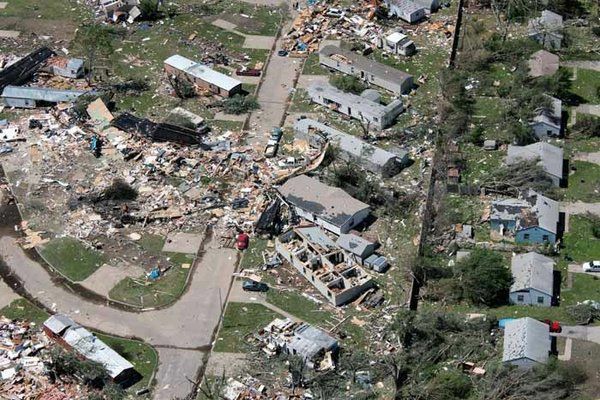 Later in the day around 100 tornado's were reported in Kansas. What great work and beautiful quilts...and how good to know that they money you helped raise can go right to work where it is needed.